Leukocyte Rolling, Adhesion, and Migration in a Single Assay! Leukocytes play a key role in early response to tissue injury/infection resulting from physical, chemical or biological stimuli. This process involves the initiation of the leukocyte adhesion cascade mediated by a series of interactions between receptors and ligands on the endothelium and the leukocytes. Specifically, circulating leukocytes tether and roll along the vessel wall by establishing transient (selectin-mediated) interactions with endothelial cells followed by (integrin-mediated) firm adhesion with eventual migration across the endothelial cells to the extra-vascular space. Typically assays rely on a flow chamber to investigate leukocyte rolling and adhesion, while Boyden/Transwell® chambers have been used for migration studies. Due to a lack of in vitro models that can in real-time characterize, rolling, adhesion and migration in a single assay, understanding of the adhesion cascade and the inflammatory processes has been hindered. In a recently published study, Prof. Kiani’s group at Temple University used SynVivo® microfluidic chips comprising of realistic microvascular networks to demonstrate an assay that resolves and facilitates direct assessment of each individual step including rolling, adhesion, spreading and extravasation of the leukocytes into the extra-vascular tissue space. The data obtained from SynVivo was validated against in vivo data resulting in the only in vitro cell-based assay that enables real time analysis of these dynamic events in a morphologically realistic environment. This inflammation assay will have critical applications both in basic research, where it can be used to characterize the mechanisms of leukocyte adhesion cascade, and in drug discovery and delivery, where it can be used for development of anti-inflammatory compounds. A wide-field view of SynVivo chip showing leukocytes interacting with endothelial cells in a microvascular network comprised of endothelium lined channels and chemoattractant loaded tissue chamber. Separating the endothelium channel and the tissue chamber is an engineered porous barrier for leukocyte migration. The endothelial cells have been activated with TNF-alpha to initiate the inflammation response. 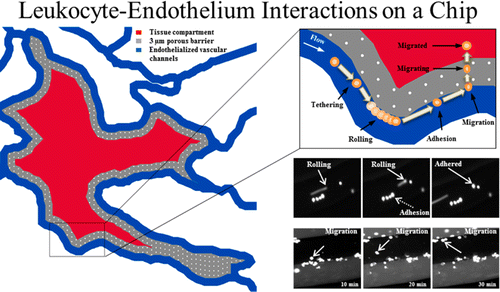 Leukocyte rolling, adhering and migration across the endothelium can be observed in real-time. Zooming in at the channel scale, additional details can be quantified including migration velocity and cell counts for regions of interest. Varying the concentration of the signaling attractant or drug interactions affecting the tightness of the endothelial layer will result in unique endpoints. Finally under high magnification the migration of a single cell can be tracked in detail, including morphological changes. To find out more about this new cell-based microchip platform check out the manufacture page for SynVivo.